Exafort to provide eTrigue as the premier Salesforce.com integrated marketing automation application. 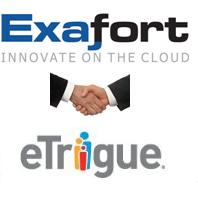 Exafort, Inc. (http://www.exafort.com), a fast growing Technology Services Company has announced today a strategic partnership with eTrigue Corporation (http://www.etrigue.com), a leading provider of cloud-based SaaS marketing automation and sales acceleration solutions. Exafort provides consulting, implementation and support services to enable rapid adoption of cloud-based marketing automation solutions. Exafort provides professional services to help institutions harness the potential of new generation Cloud, Mobile, BI and Enterprise 2.0 technologies. Exafort helps clients attain effectiveness, enhance efficiency, get end-to-end visibility, accelerate innovation and rapidly adapt to constantly changing business landscape. The team has deep domain, cross-functional expertise to handle the most complex deployments with utmost ease, delivering high value and services to customers ranging from privately held mid-market companies to Fortune 500 firms. Headquartered in Santa Clara, US, Exafort has offices in U.S., and India. This mix of onshore and offshore expertise offers cost effective, comprehensive service, as well as follow-the-sun support for its clients. For more information about the company please visit http://www.exafort.com or call 1-888-861-2341. Since 2005, eTrigue continues as the ease-of-use leader and provider of Intelligent Demand Generation™ SaaS products that improve and accelerate the way marketing and sales teams generate qualified leads and close sales. The DemandCenter™ marketing automation platform helps marketers build more successful demand generation programs that target, nurture and qualify prospective customers based on their "digital biography”, and give sales teams the real-time intelligence they need to identify, prioritize and effectively interact with prospective customers. For more information please visit http://www.etrigue.com or call 1-800-858-8500.